Ever had one of those emergencies where you had to quickly come up with an adorable infant gift within a time crunch? No? Um.. well here's a tutorial anyway for a cute little crinkle toy. Coz when it comes to babies, there's nothing quite as amusing as the puckery, crumply, creasy sound of plastic! We've gone one step ahead and made a toy that's not just crinkly, it's also soft and cushiony. And the best part? All you need to spend time-wise is an hour at most, from start to finish. Basic sewing supplies such as sewing machine, thread, needle, pins, cutting mat and rotary cutter (optional), scissors, ruler/ tape, tailor's chalk or fabric marker, iron for pressing. ¼ yard or 1 Fat Quarter green fabric for the leaves. 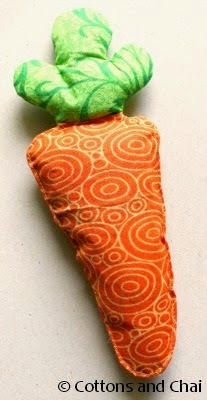 Finished Size: The finished carrot is approx 9" long and 4" wide. 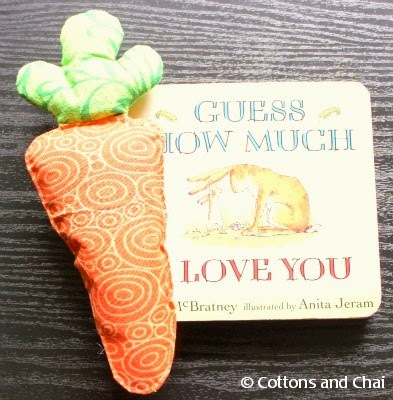 Here's an idea: Pair up this crunchy carrot with a popular bunny board book and you have a winning combination of handmade and ready made gift! Tools for School! 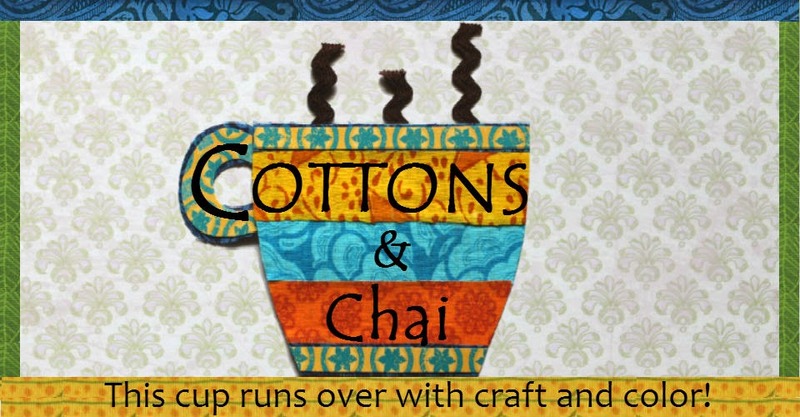 Back To School sewing projects.